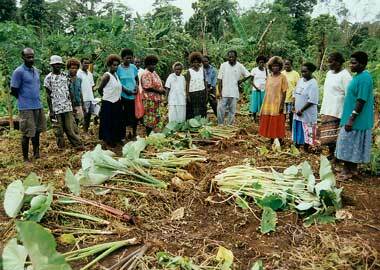 The Taro-Gen Project …by Jude Fanton, director of the Seed Savers Network in Byron Bay, Australia, April 2002. A report on the taro diversity fair held in the Solomon Islands, an activity of the Taro-Gen Project of the South Pacific Commission. The Planting Material Network (PMN) carried out field work for Taro-Gen.
A total of 843 varieties of taro have been collected by the Planting Material Network in the Solomon Islands over the last year as part of the Taro-Gen project funded by the EU and the South Pacific Commission. Taro is an important root crop in the Solomon Islands. The Taro-Gen project attempted to identify many of the varieties grown in the provinces. In each of four provinces, a central garden has been used to grow out the provincial taro collection and a diversity fair held. The diversity fairs were timed for the taro harvest in March and April. Michel and Jude of the Seed Savers’ Network attended the diversity fair on 15 and 16 April on Malaita, an eastern island of the archipelago. It was held inland in the mountains in Central Kwarae and attracted over 200 people from around Malaita. Over 200 taros that had been grown out were on display. Groups of people took samples of ten taros which were enclosed in nodes of a large bamboo and cooked on a fire, then taste-tested and scored. At the end of the two days, the taros were divided for people to grow in their own gardens. In all their lives, the older people had not seen such a diversity of one of the staple root crops of the Solomon Islands. Taro is the most nutritious of the root crops grown in Melanesia but is becoming neglected in favour of sweet potato and cassava, both of which require a less fertile soil. Soil fertility is declining due to population pressure on fragile and steep forest soils. However taro is considered the best crop for weaning babies and feeding young children. The Planting Material Network is focusing on methods of improving soil and conserving as many taro varieties as possible. Retaining diversity is very important as some varieties perform well in dry years and others in wet, some are more resistant than others to the many diseases and pests of taro and others are suited to particular soils. Some of the visitors brought along more varieties and were awarded prizes. In the competition for how many varieties you could name, an older woman won the prize by naming twenty. I felt I knew a bit about taro before I went along, but by examining so many varieties, I now know where to look for distinguishing marks (and there are many). Colour, for example, whether green, purple or red and what shade – of the leaf spots, stems, collars, tubers and flesh – is an obvious determining characteristic. Then there are stripes on some stems and some tubers are round while others are elongated. Cooked by steaming, sealed in a bamboo node, is a delectable way of eating taro, but taro chips fried in oil and boiled, mashed taro are delicious. There are many strong customs related to the growing of taro. One must not enter the taro garden after eating turtle or mangrove fruits. Menstruating women are not allowed in. The taro must be cut and harvested with a particular type of small, shiny, sharpened shell, not with a knife. Taro has a mystical significance for many tribes. It is likened to human beings. The speeches from a beautifully decorated dais emphasised the need to conserve taro diversity in situ and to value both the nutritional and cultural aspects of this crop.